Most often, pix on the net allegedly SRK's house, are not. The original Mannat was done in minimalist style, so unless they had a radical change of design in the newer part of Mannat (Annexe) I really dont see how some of these pix could possibly be of Mannat or Mannat Annexe. Unfortunatly I can't see the pics. But I agree - there are many pics around which are obviously not Mannat. When you watch Inner/Outer World or Living with a Superstar you can see that Mannat looks completely different. It is annoying indeed. You are 100% correct. None of those are the house and all the others are recycled from old magazine stories. Press is so desperate to have SRK in a headline, its crazy. My favorite is the still from one of the early movies, Yes, Boss when he is driving or in a convertible with other people and he is parked next to what was to become Mannat. It is a great pic. Google Mannat in Yes, Boss. I tried to put in the link but it is crazy long and might not work. The lore is that it was during the shooting of this scene he became aware of the property and decided to buy it. 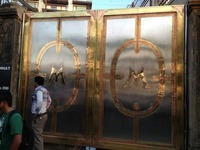 New mannat Gate is looking very nice, The new look attract the people to see it. I also want mannat type house but I know i can't achieve it.But hopefully I would make of hope to get it. Anyways Congratulation for new gate of Mannat. oh that's an interesting tidbit, didn't know that, thanks! Random question: I am always wondering, what the "old" part of Mannat is used for, since they got the 6 floors behind it. Does anyone know? I mean the living rooms, bed rooms, dining, office, gym etc is all in the new building... what's left in the old one? Maybe for guests, parties, servants quarters etc? I'm just wondering that's all! something I wonder about, when the Annexe was built, SRK apparently gave Farah and Karan an office each in the building...wonder if they ever used them. As for the *old* Mannat, maybe they could be using it for staff accommodation? Maybe the part about Farah and Karan is fake news..?